As I have said before, God's timing is rarely our own. Just when we think we have designed the perfect plan, God comes in and after a brief chuckle, reminds us that when we are seeking him and are willing to live out our lives according to his purpose, we must be open and willing to follow his plan, regardless of what it looks like...whatever time, whatever place. 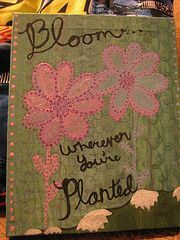 When I was in grade school, we would sing a song in church called Bloom Where You're Planted. It was a simple song and for whatever reason, it popped into my head at least half a dozen times last week. While searching for a copy of the song, I instead found this video clip from the movie Facing the Giants. It was as if God placed that old song in my head so that I would find this clip and be reminded that he is the one who opens doors that no one can shut. In addition he is constantly seeking to use each one of us, right where we are. However, we need to remember to first do the work that is required on our part, in faith and in deed, so that he can do the work required on his. With an eleven-year-old-new-to-America son and three rambunctious preschoolers in our home, I would have laughed (and trembled in fear) if someone had told me six months ago that two doors were about to swing wide open. I have been preparing myself for the first door, cautiously yet optimistically in a neat little box; however, the second door caught me by complete surprise. Through door number one, I will head to seminary in order to study God's Word and gain a better understanding of how to practically apply theology to today's generation and future generations. Through door number two, I will immediately begin putting to use the knowledge gained through door number one. Starting this Monday, I will retire my SAHM status and assume the Director of Welcoming Ministries position at our church. Through both doors, simultaneously and in ways unseen and unknown at this point in time, God will provide the opportunity to serve him, serve others, and grow in Christ. While I can see a faint glimpse off into the distance, the operational and tactical details of his plan are still blurred. Because he is a loving God who knows me most intimately, he understands that too many details all at once will distract me and cause me to be anxious. So instead, he is whispering, "Put one foot in front of the other and trust that I am there. When the time is right, more will be revealed." I am excited beyond words to see his plan play itself out in our family, the life of our church, and the life of our community. Six months ago, I would have never imaged returning to 'work' this year because I was under the mistaken impression that God was going to keep me at home until all of our children were in kindergarten...because that was my plan, and why wouldn't God just fall in line with my plan and then I could just give him the credit? Sounded good to me! However, I completely trust that he is the one opening these doors because I feel his comforting presence and a peace that cannot be put into words. Instead of worrying, I am acting and taking the steps necessary to make sure the daily logistical concerns are taken care of. Instead of making excuses for why the timing is not right, I am trusting that he is always on time and praying that his strength is made perfect in my weakness. As Colossians 3:23 says, "Whatever you do, work at is with all your heart, as working for the Lord, not human masters." As our family prepares ourselves, yet again, for change and growth, we will continue to pray that God makes his desires clear and provides all that we need to be successful. We pray that are able to view every day as an opportunity to serve with all of our heart and bloom where we are planted. Below are two verses and the chorus of the song Bloom Where You're Planted. I have not heard or thought about this song since grade school, but as always God's timing is perfect. Bloom, bloom, bloom where you're planted. Let yourself be! Let yourself be! Look at the gifts that you have been given. Let them go free! Let them go free! I was wondering if you would happen to have sheet music or know the tune that song you mentioned in this post were sung to? I can only find the lyrics and not the actual tune. Thank you for any help. I found a few websites that sell the sheet music. One is below Good luck!